The interpretation of heritage, care of the cultural and creative identity and its connection with tourism are a part of the creative and cultural industries, today the fastest growing branch of the economy, insufficiently evaluated in Croatia. Therefore, the linkup of Muses with the Croatian Cluster of Competitiveness of Creative and Cultural Industries (HKKKKI) has the aim that we contribute to the creation of a better and more beautiful community via the promotion of intellectual ownership, the planning of better cultural policies and the creation of new opportunities in business and in culture. In Antiquity Zeus’ throne in modern times - a cluster of creators. This would be the shortest way to describe the historical change of the working environment of Muses. However, if the workplace changes, then the artists’ muses have descended from Olympus into offices, museums and onto the streets, but their mission in the modern world still remains the same. Over more than 10 years of collaboration in the promotion of the interpretation of heritage with numerous top designers, artists, photographers, illustrators, authors of interpretive texts the Croatian Muses have also proved that. Wanting to improve it for the well-being of society, in an important move in November we joined the membership of the Croatian Cluster of Competitiveness of Creative and Cultural Industries, the umbrella organisation that links the creative sector and networks representatives of these industries with the economy, and the state with academic institutions. How did the Cluster coax us? “The work of creatives is present in 99% of all products or services on the market, which sufficiently speaks that their skills and work should be encouraged and valued equally as all other participants of the production process and we will also work on that in the years ahead of us. The recognition, authenticity and attractiveness of the state, regions, towns as well as the products is the key contribution of our sector through which it has a direct influence upon competitiveness”. And its evaluations are based on numbers and trends, still insufficiently recognised in Croatia. According to the words of Martin Schulz, the President of the European Parliament “culture actually contributes the most to European wealth”. In the GDP of the European Union culture participates in 4.2%, the annual income is 535.9 billion Euros, more than 7 million jobs are connected to the sector, and this is mostly in small businesses. And what does the data say about Croatia? Home creatives in the national GDP account for 2.3%, the sector employs 42,000 people, and creates more than 15 billion kunas income per year. Can we be happy with that? “The importance of the industry is still not sufficiently recognised and is positioned in existing policies, strategies and laws”, says Davor Majetić the Director General of HUP (the Croatian Employers’ Association). Therein, the cultural and creative industries, it is claimed, are a real antidote to the crisis. They even grow during economic difficulties, they rely heavily on the local labour force, particularly on the young – the group endangered the most by unemployment. 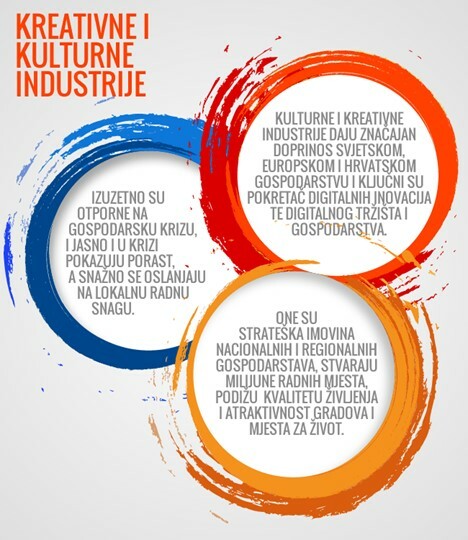 It is in fact these features that the ‘Kreativna Hrvatska’ (‘Creative Croatia’) project, established in 2014 as a joint initiative by the HKKKKI and HUP which is bringing together associations, institutions, towns, universities, agencies and private businesses, wants to develop. The idea of placing creative industries in a better social frame is based on five sectors, the first is based on the experience that without strong infrastructure and institutional support there is no development. Although the programme is located somewhere in the centre, one of the key tasks is to explain to public policymakers how the creative industry is not “a consumer of state finances”, but on the contrary a profitable investment. In doing it is not only necessary to raise awareness of the general workers but the public in general which still perceives the recognisability of Croatia as a country with a rich cultural identity as “self-explanatory” saying - “and who is like us”. The telling of a good story about yourself is a demanding and above all creative job that demands serious preparation: the inclusion of creative and cultural industries in national and economic strategies, the mapping of its resources, the stimulation of professional standards etc. It is not enough to just sum up the status quo but to encourage research activities, innovation, business experiments in creative and cultural industry as well. This also means the inclusion of all economic, social and governmental sectors, then the encouragement of international collaboration and the strengthening of the presence and positioning of national creativity on the international markets. A special importance is that which is bureaucratically called the development of human resources, and which in reality means the creation of such an educational system which will “create creators”, as well as skilfully positioning them on the labour market. In doing so the creation of the sector of a human factor is one thing, the other is training in management, the knowledge of the possibilities of European markets, and the possibility of innovative financing. What is especially important is that the public is informed in the right way, more precisely that the effects of the overflow of the creative and cultural industries onto other industries and society are presented and explained to it. In this sense, what kind of experiences can Muses bring to the Cluster? In all the projects of the interpretation of cultural and natural heritage, which we have worked on, it has been shown that heritage, as a specific form of national identity, is a great inspirer plus the work of creatives. We have inspired their works of art with stories of various cultural and natural phenomena, which resulted from the development of a large number of visual materials, films and animations, interesting furniture design, multimedia apps etc. For example, in a three-year project of the interpretation and presentation of the natural heritage of our national parks, nature parks and other protected areas Muses have collaborated with an interdisciplinary team of designers, from graphic, multimedia and product design. Through the interpretive planning and the establishment of numerous visitor and interpretation centres the processing of more than 2,500 photographs, more than 1,000 illustrations, 1,000 pieces of furniture, almost 200 films and animations and many more varying products from the creative industries and so on has been carried out. As in industrial displays numbers are worth more than words we’ll just mention Ivana’s House of Fairy Tales in Ogulin. In the exhibition space of 100m2, more than 100 varying creative formats are used, so more than one per square metre. In this sense it could be said that the gift that Muses bring to the Cluster from Olympus is by no means small. Even more so because a good part of our projects has been created in an environment that could be called a kind of creative pre-industry.